International Game Technology or IGT is largely considered one of the oldest slot software suppliers and manufacturers in the industry. Over the years, the name IGT has become synonymous with tradition and above all with quality, diversity and innovation. 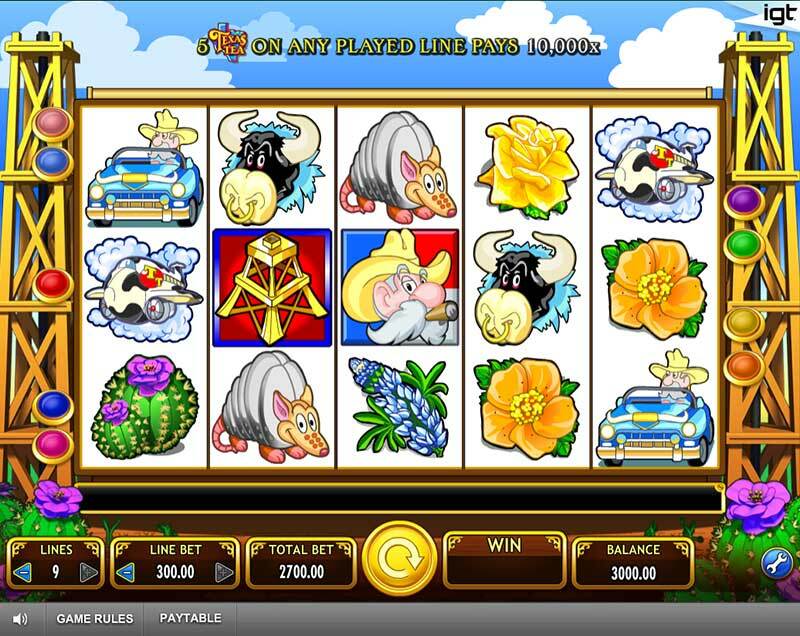 The slot titles that are courtesy of the software developer are highly regarded by fans of this type of game thanks to their great visuals and beneficial features that work to the advantage of players. IGT’s slots collection is quite extensive and poses as a nice mixture of original themes to meet the needs of all players and comply with their individual interests and preferences. Most of the titles follow the standard three-reel or five-reel formats and offer a range of different paylines. The interface of the games is simplified and user-friendly which allows both seasoned and less experienced slot fans to place their bets with ease. Of course, there is the option to adjust all important parameters in the games, such as the coin value, the number of coins per active payline and which paylines to bet on. Players get to adjust the graphics’ quality in accordance with their internet speed which guarantees a smooth gaming experience. Typically, the games have larger betting limits with minimum and maximum wagers per payline that vary between 0.50 and 50.00 credits. However, prior to placing your bets on an IGT slot, you are recommended to first check what the payout percentages of your slots of choice are. Choosing an IGT slot that offers a higher return to player percentage always pays, so it is a good idea to opt for titles that are said to have an average payout of at least 95.00%. Read on to learn more about IGT’s accomplishments in the industry and which of the supplier’s online slots offer the best payouts. IGT is among the oldest slot software developers in the world. Its history can be traced back to the 1950s, but it was in 1981 that IGT became a publicly traded company. Over the years, IGT introduced many innovations to the gambling industry. It became the first gaming technology provider to offer video poker machines and helped pioneer the frequent-player rewards and the computerised player tracking programmes. IGT is also to be held responsible for the electronic bill acceptors that have become an essential part of most landbased slot machines. On that note, it is worth mentioning that IGT used to specialise predominantly in the software development and manufacturing of landbased slot machines. The company is considered the first one to introduce a progressive slot game, namely the Nevada Megabucks slot machine, which had a jackpot of $1 million. In addition, IGT introduced the first themed slot machines in the industry – Double Diamond and Red, White and Blue. In 1996, IGT birthed the Wheel of Fortune, which went on to become one of the most popular progressive slots of all times. As a whole, IGT’s progressive online slot titles enjoy an enviable popularity among players which is to be attributed to the fact that the company’s progressive jackpot network starts at a seed of £1.5 million. The year 2005 was marked by IGT’s acquisition of the American gaming company WagerWorks. This was an important step for IGT since it enabled the company to make a smooth transition to the online gaming market. Thus, IGT’s extensive catalogue of landbased slots was introduced to the online gambling community as it employed the software technology WagerWorks has already developed. 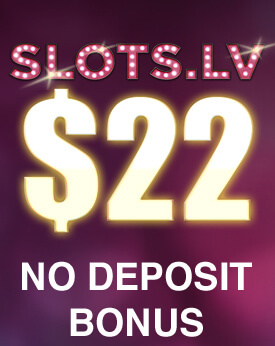 Below, you will find a list of five of the most popular online slots IGT has to offer. The games in question are very sought-after since they are among the IGT titles that offer the highest Return to Player Percentages or RTP and boast immense winning potential. Check them out and see which ones correspond the most to your individual preferences. Wheel of Fortune easily wins the title of the most popular title in the IGT slot collection. This immense popularity can be attributed to the fact the slot is based on the well-known television show of the same name. 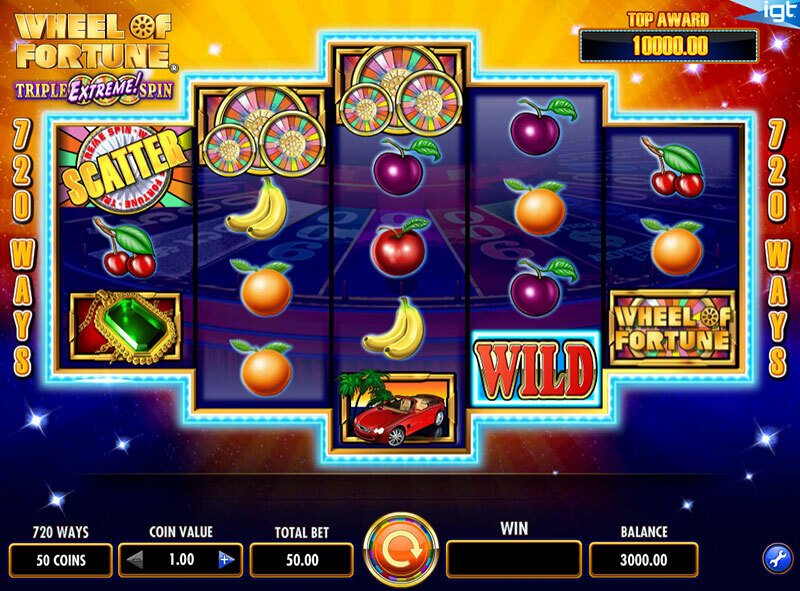 In addition, Wheel of Fortune offers great graphics and lucrative bonus games that all players are striving to unlock. The Triple Extreme Spin Edition of the game is played on five reels and utilises the 720 way to win format. The game employs various classic fruit symbols like cherries, oranges, bananas, and of course, the iconic Wheel itself. There are also a yacht, a pendant and a red convertible car, which are the highest paying symbols in the game. The wild symbol can complete winning combinations only when it appears on the second, third, and fourth reels. Players, who land three or more scatter symbols in any position, will unlock the coveted Mini Wheel Bonus game which can potentially earn them profits that amount 50x to 3,850x their coin value. The symbol containing three wheels can trigger the Triple Extreme Bonus. Once this bonus game is unlocked, players are expected to pick a number of envelopes that corresponds to the number of the bonus symbols that have unlocked this feature. Three wheels that are blue, yellow and red will appear on the screen. The yellow wheel determines the multiplier, while the red and blue ones determine how much credits players will win. The payout ratio for the Triple Extreme Spin Edition of Wheel of Fortune stands at 96.08%. Please note, there are several editions of the Wheel of Fortune slot. These include Wheel of Fortune Hollywood, Wheel of Fortune Ultra 5 Reels and Wheel of Fortune on Tour. IGT has succeeded in recreating the atmosphere of the largest US state with their entertaining Texas Tea slot. This is a five-reel game with a total of 9 paylines. The reels are loaded with symbols that relate to the state of Texas including cacti, bulls, armadillos, and oil derricks. Many slot fans prefer this title because it has lower volatility. If you do give Texas Tea a try, you may notice the game pays out rather frequently. Besides, the 9 paylines it offers are not fixed, which only works to the advantage of players as it allows them to adjust the number of lines they wish to bet on. The four highest paying symbols in the game are the armadillo, the bull, the jet plane, and Texas Ted in a car. What is great about this game is that each of these lucrative symbols pays out whenever the player lands two of a kind, instead of three of a kind as is the standard with other online slots. There are two great bonus features to look for. Whenever players line up three or more oil derrick symbols on the paylines, they unlock the Big Oil Bonus mini game. The said bonus game guarantees profits that range between 30x and 200x the line bet. The other mini game is the Oil Dividend Bonus, which is triggered whenever players land three or more symbols with Texas Ted, which are the scatters in this slot. Your profits depend on the number of scatters you line up on the reels but, generally, unlocking this bonus game guarantees you prizes that range between 3x to 100x your total bet. As the name itself suggests, Pharaoh’s Fortune boasts a theme that is inspired by Ancient Egypt. The game, which is among the most popular offerings in IGT’s online slot collection, is played on five reels and allows players to bet on up to 15 paylines, with the option to choose which ones to activate. 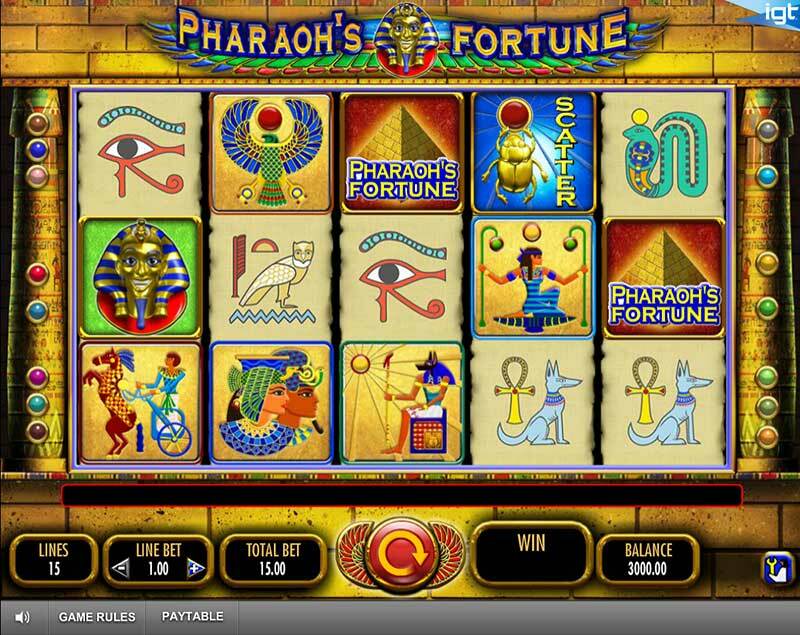 Some of the symbols players are likely to encounter in the Pharaoh’s Fortune slot include a wolf, a phoenix, a snake, an owl, a Scarabaeus beetle and the Eye of Horus. All of the symbols artfully recreate the ancient Egyptian inscriptions. The Pharaoh’s Fortune logo plays the role of the wild symbol in the game, while the Scarabaeus beetle and the Sphinx are scatters. Many players choose Pharaoh’s Fortune for the great functionalities it offers. For instance, if you manage to line up the Pharaoh bonus symbol on the first, second and third reels, you will unlock the Pharaoh’s Fortune Bonus. 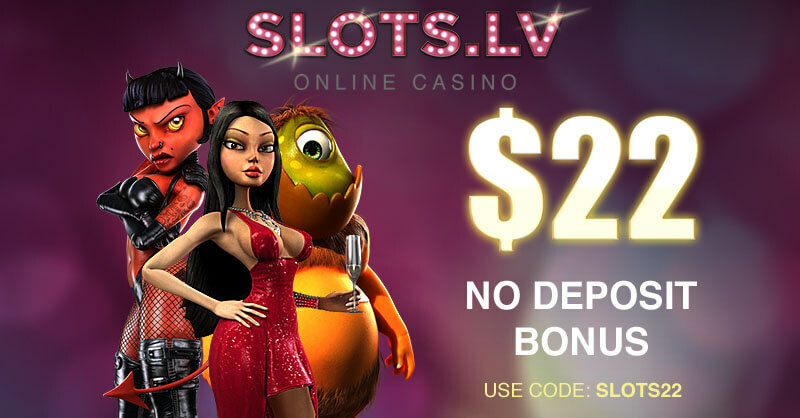 The bonus game starts with 3 free spins with a 1x multiplier. Then, players will encounter 30 stone blocks which they are supposed to turn because they contain extra free spins and greater multipliers of the winnings. The maximum number of free spins you can get is set at 25, with multipliers of up to 6x. Some of the features are unique to IGT slots exclusively. For example, when the Pharaoh’s Fortune Bonus feature is unlocked, the number of available paylines increases from 15 to 20. But what is more important, once players succeed in triggering this bonus feature, they are guaranteed to win on every single free spin they are awarded. Also, if you are interested in playing the game on the go, you can easily do so as Pharaoh’s Fortune runs smoothly on Android and iOS-based devices. The game’s average return percentage stands at 96.53%. 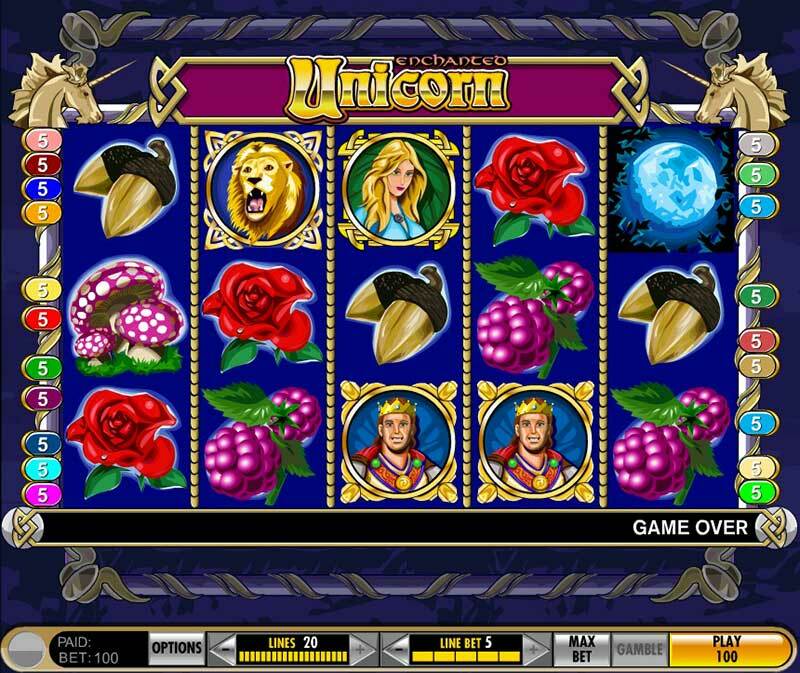 IGT’s Enchanted Unicorn slot features five reels, with a total of 20 paylines. The game boasts a fairy tale theme and includes symbols like red roses, lions, golden acorns, toadstools, pine cones, and treasure chests. Some of the standard features like wild and scatter symbols are also available. The highest paying symbol in the game is the lion – those, who are lucky enough to line up five lions on the reels, will be rewarded with the hefty prize of 2,000 credits. The full moon symbol assumes the role of a scatter and multiplies the wins players have generated by the number of full moons they have landed on the reels. The unicorn symbol functions as a multiplier and can even transform the entire reel into a wild symbol. However, the Treasure Chest Bonus game is what all players covet because of the huge winning potential it carries. The bonus game gets activated whenever the treasure chest symbol ends up on the first and the fifth reel simultaneously. A treasure grid will appear on the screen and each tile it contains stands for a different prize value. Players are expected to select some of the tiles to collect the prizes they offer and avoid the evil wizard, whose appearance will end the bonus game prematurely. 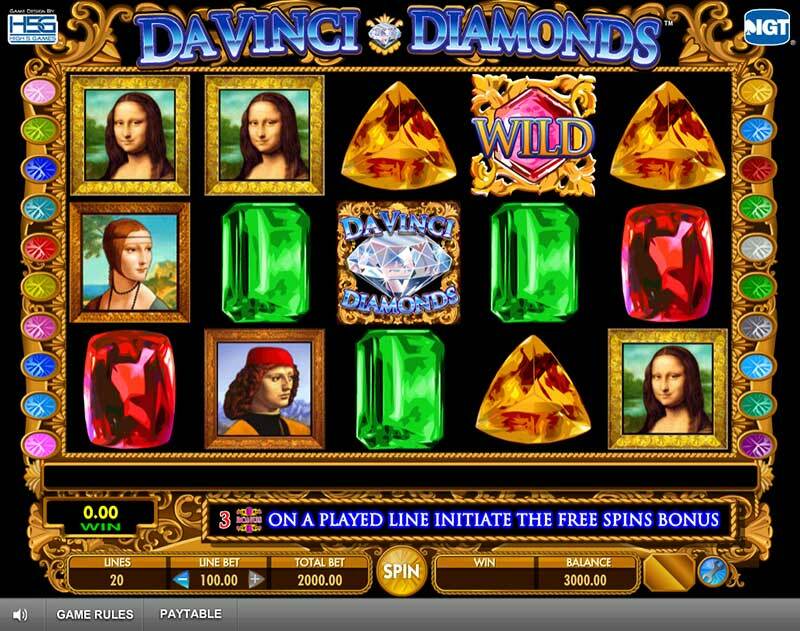 Da Vinci Diamonds enjoys a great popularity among fans of IGT thanks to its high payout percentages, appealing visuals and great features. IGT was obviously inspired by the Renaissance period and Leonardo Da Vinci, in particular, as the slot employs various paintings by the Italian polymath as symbols. These include the Mona Lisa, the Lady with an Ermine, and Da Vinci’s Portrait of a Musician (the guy with the red cap). The lower paying symbols are represented by precious stones of different colours. The game features not one but three scatter symbols and is played on five reels, with 20 paylines. Players, who are lucky enough to land three or more bonus symbols on the first, second and third reels, will be able to initiate a round of 6 free spins. Each time players succeed in landing another bonus symbol during this bonus round, they will be rewarded with more free spins. As a matter of fact, the number of free spins you might get in the game is capped at 300. Also, the symbols in the slot fall from the top of the screen instead of spinning in reels thanks to the Tumbling Reels feature.